By geography, the new outpost from Reuben’s Brews doesn’t seem like a prudent business decision. It’s just a 10-minute stroll from its flagship brewery in Ballard. Won’t Reuben’s second brewery cannibalize its own business? And just how many IPAs can locals down anyway? Ballard already has 11 breweries and will get two more later this year, with talks of more coming next year. But Adam Robbings, co-owner and head brewer at Reuben’s, isn’t losing sleep with this oversaturation chatter. He believes his new tasting room “will take the pressure off” his flagship brewery, which is already teeming every weekend with crowds. And the peak summer rush isn’t even here yet, said Robbings, who opened his acclaimed brewery in 2012. “I don’t know when too many is too many,” but this brewery district hasn’t peaked yet, said Robbings. Coming this summer, Fair Isle Brewing and Urban Family Brewing Co., two high-profile projects, will join this beer-hopping ‘hood. And with more brewers shopping around the Ballard industrial area for real estate, those who already have a foot in this enclave are making an aggressive play to expand before all the warehouse spaces get gobbled up. Stoup Brewing, the other anchor in the Ballard microbrew scene, is taking over part of the ground floor of a new four-story building that abuts its beer garden. The expansion will allow this brewpub to double its beer production to 12,000 barrels over the next five years, with room for a canning/bottling operation, said Stoup co-owner Lara Zahaba. This comes after Stoup had already added space upstairs in its current taproom to handle the crowd overflow during summer. Four blocks south sits Populuxe Brewing, which has already expanded into a 4,000-square-foot facility to triple its seating capacity. No one, though, has been more bullish than Reuben’s, whose latest tasting room, with capacity to hold 130, sits off the busy drag of Leary Way Northwest. The new space, which opened Thursday (Feb. 28), will feature many of Robbings’ signature beers including his gose and Crikey IPA on its 12 taps. He’s adding a kiosk to allow patrons to order food from Giddy Up Burgers, about 200 feet away. It should attract locals who want a more low-key vibe when the main brewery gets packed, he said. Meanwhile, his flagship brewery, about five blocks away, will continue to showcase his full portfolio, including many experimental brews that beer geeks love. 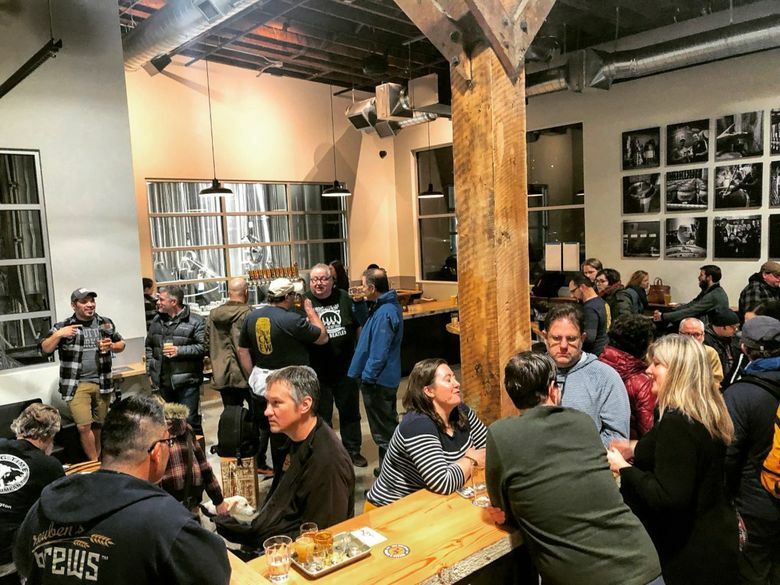 Given how busy the breweries are on Fridays and Saturdays, Jamie Butler, co-owner of the nearby Trailbend Taproom, which opened last spring, thinks Reuben’s expansion is a good investment. At his bar, Butler said Trailbend Taproom takes in about $10,000 in sales on Saturdays, five times more than on Mondays. “On weekends, the core of the people are coming from all over — crosstown or wherever. They are doing the crawl, hitting the breweries,” Butler said. Or maybe a martini instead of a pilsner is more your calling? Well then, Seattle Cocktail Week kicks off March 3. They’ll have a big bash on March 9 at the Bell Harbor International Conference Center, complete with a “tiki village,” “Gin Garden” and other drink festivities. But the better deal is during that week, when more than 60 bars will offer drink specials and discounts. It’s a great chance to check out some under-the-radar bars that aren’t household names. Since we’re on the subject of Ballard, check out the underrated Corner Spot owned by one of the founders of Zig Zag Café. That cocktail bar will hawk $9 cocktails during Cocktail Week. And the Little Tin Apothecary bar will do a $13 cocktail with a mini pupu plate. A block away, The Gerald will host a couple of events with local distillers and, on March 10, the bar’s entire booze collection including its top-shelf stuff are 50 percent off.